Underground environment is completely different from the Earth surface one. To make an underground location available for potential users, its detailed description, presented to potential customers in an easy-to-read and unbiased manner, is absolutely necessary. This is the subject of WP2. The aim of WP3 is to find tools, systematics and support systems to optimize the ULs so that they attract innovative projects, and so that innovation can take place in an UL, and finally that innovation can reach the market. In the WP4 underground working environment will be described as well as the assessment of risks. Dissemination of best practices and development guidelines will be shared. 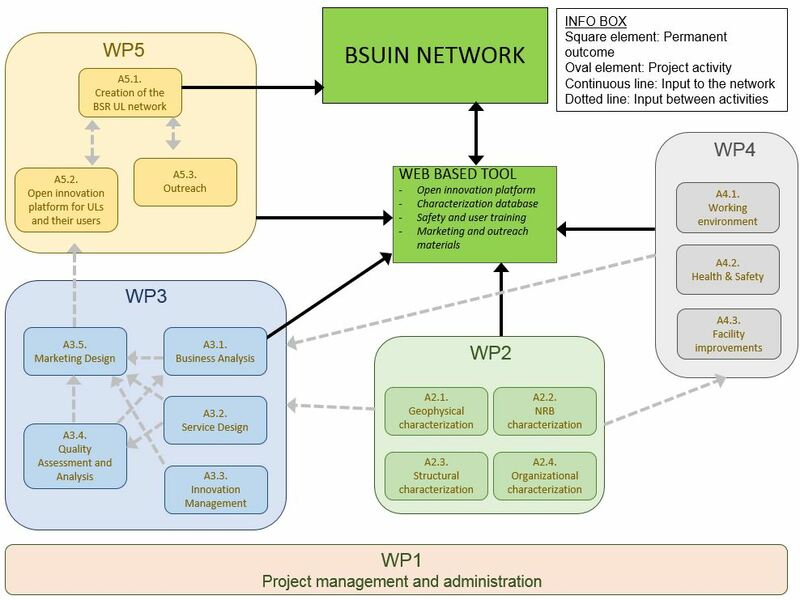 Creating the BSUIN Underground Laboratory network is part of the WP5 activities. The BSUIN network will continue to maintain the joint web-based platform for innovation activities and sharing technical information, marketing material, training, safety and other instructions to stakeholders and interested parties.